This monster squash is sold by the piece. Buy vegetables in season. Instead of buying according to your recipe, choose your menu according to the prices. Learn to cook unfamiliar, but inexpensive, vegetables like turnips or celery root. Buy more vegetables and less fruit, which usually costs more. Prepare a container of cut up raw vegetables for easy snacking. Use up nearly all your produce before the next shopping trip. Adjust your list according to how much you used that week and any special circumstances. Use as much of the vegetable or fruit as you can. Peeling removes much of the flesh and the vitamins too. Don’t believe me? Weigh your potatoes before and after peeling. It’s better to scrub the vegetables with water and a stiff brush, cook the vegetables, and then remove the peel. Use raw peels, leaves and roots for soup stock. Dried vegetables, like beans and split peas, are usually cheaper than fresh and contain many of the same vitamins. Get together with your neighbors to buy in bulk. This works for large bunches of herbs, organic foods, grains, and more. You’ll save on shopping trips too. Learn to choose and store produce correctly, and don’t forget about it. Preparing vegetables the day before you cook encourages you to cook more. It does reduce the vitamin content somewhat, but it’s better than letting the vegetables go to waste. Make friends with your grocer. 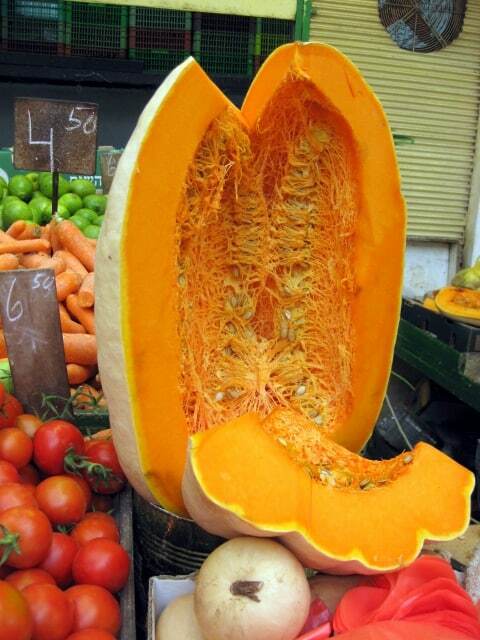 You may get access to misshapen or older produce that is still edible. Get good at using up leftovers. Learn to make soup, patties, and quiches without a recipe. I love your blog! I am looking forward to making soup stock from my peels and roots. I always dislike throwing them out, and it’s exciting to have a use for them now! Excellent! Thanks, Rivki, glad that made your day. This is a great post. Your points are so sensible. The chefs I studied with in Paris always used vegetable trimmings in stocks, like green tops of leeks and even the skins of tomatoes (from the recipes that call for peeling tomatoes). Our head chef at cooking school always said “A good chef is a frugal chef.” I use cauliflower ribs, cabbage bases, turnip tops and bottoms. I was surprised to find that the hard tops of zucchini become soft enough to eat after they have cooked in stock. Are there any vegetable trimmings that you do not like in stock? If I have to peel a cucumber because its peel is bitter, I don’t use it in stock. Once a sweet potato peel gave my stock a bitter flavor, probably because that peel was too dark. Thanks again for all these great tips. Hi Fay, thanks! I also wouldn’t use cucumber. I rarely peel cucumber, and I cook most root vegetables with the peel on. So it either gets eaten, or a thin layer taken off. I am not as ambitious with you and the trimmings! I will have to experiment with more unusual ones. Thanks, Hannah! Actually, you are the one who inspired me to use more kinds of trimmings! I hadn’t though of the turnips until I read your article. I am very curious about 2 other points: Would you expand on the idea of buying more vegetables and less fruit? I can see maybe putting out carrot sticks as snacks instead of apples (though I don’t know how well this would go with husbands and kids!) or making carrot cake instead of apple cake, making kugels from potatoes, sweet potatoes or carrots instead of using fruit, but what else? The other point is dried vegetables being cheaper than fresh. But other than dried peas instead of fresh or frozen peas, how can use one instead of the other, since dried beans are more of a meat substitute because of their protein, while fresh vegetables have other functions, adding color, a feeling of fullness from relatively low-calorie foods, a lively side dish, a great element in soups, etc. etc? Faye: I think that sometimes my family eats too much fruit, snacking on it all the time. I do the things you mention and can’t think of more ideas than that. My point is that dried beans provide some of the same vitamins as fresh, but perhaps I should have emphasized that fresh vegetables are also important. Cooking with only dried vegetables would make life rather dull, we’re lucky we can get a variety of fresh ones around here. But for some, frozen vegetables are the best bet. Sorry about the typos in my latest questions. It was very late and I should have been asleep but I couldn’t resist writing to you. Faye: If I can misspell your name (I since corrected it), I’ll allow you a few typos. I didn’t even notice them. Thanks so much, Hannah. My cousin grows vegetables and dehydrates a great variety of them for the winter (she lives in a cold climate region). I don’t find many dried vegetables at the markets besides the usual onions, mushrooms, hot peppers and tomatoes, but these are useful to keep on hand as an addition to fresh. I agree with you, dried beans are great, and frozen vegetables are a good idea when you can get them as a good buy (or blanch and freeze your own). I keep thinking about your post and have been trying to figure out how you compare various fruits and vegetables to each other to determine which is cheaper per serving, not per pound. I’ve been searching and cannot find a chart that gives you servings per pound of produce. Have you come across one? For me it’s quite simple: fruits are simply more expensive than vegetables, in season. Fruits usually cost double, when bought by weight. But there are different ways to calculate costs, as you’ve found. but that site doesn’t have one of fruit. Thanks, Hannah. When we discussed your point on using more dried vegetables, I did find another instance of when this happens. When I am very busy and I have cooked dried beans on hand, I use a higher proportion of the beans in my soups than of fresh vegetables. My husband likes when this happens because when he’s very hungry, he’d like to get to the satisfying beans right away instead of having to “eat through” all the vegetables that are sort of “in the way”!